Is Indonesia more democratic than the UK? Indonesians love to complain about politicians, about parliament, about political parties. But they are much more enthusiastic democrats than citizens of many other nations. More than seven out of ten of Indonesia’s 171 million registered voters showed up at the polls in the last national parliamentary elections in 2009, compared with fewer than two thirds in the UK and a lamentable 40 percent in the US in 2010. Most expect a high turnout in today’s elections, too. Indonesia is also more generous with its democratic rights. While the UK Supreme Court agreed that it was just fine for the government to deny citizens a voice in how they are governed if they are in jail, Indonesia allows prisoners to vote. Those organising the three voting stations for the 1,025 potential voters inside the Pondok Bambu prison in Jakarta have chosen “Love Indonesia” as a theme for the prison polling stations. They plan to decorate them with bunting, and all the officials will wear batik shirts, the informal national dress. Really, what’s not to love? 1 Comment on "Is Indonesia more democratic than the UK?" 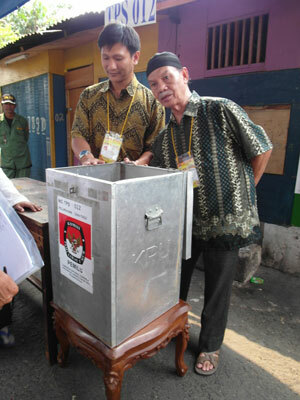 “Indonesia allows prisoners to vote“, but not those sentenced to more than five years. And if there is a high turnout, it’s likely to be because of the choice of prospective candidates in the presidential election to be held on July 9th, only one of whom is not an oligarch with Suhartoist connections. As Jakarta Vice Governor ‘Ahok’ suggested yesterday, the rakyat will probably vote for “the best of a bad bunch”.